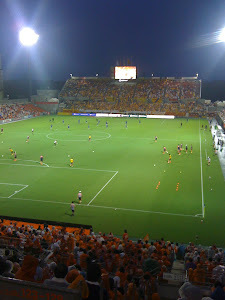 Very sorry about letting this blog about Omiya Ardija drift....It's been quite a season and it's not over yet. 3 games are left and it's still all to play for. The Squirrels find themselves in 14th place and on 37 points which in most seasons would be enough to avoid the drop into J2. This year, however is very different and 40 or 41 points is likely to be the goal to survive in J1. Then again it might be even more. This season's relegation dogfight has been more exciting and involved then any season I can remember. Going into the last 3 games I make it that 7 teams still have something to worry about. It makes it edgy and nervous for fans of the teams in the mix, but great excitement for neutrals. Ardija's remaining games are away to Cerezo, and then a massive double header against Shizuoka - a final home game against Jubilo followed by the last game of the season away to Afshan Ghotbi's impressive young Shimizu S-Pulse side. I feel at this stage that Cerezo is our best chance of taking all 3 points, even though trips down to Osaka are never easy. Shimizu on the last day is going to be a very tough proposition with S-Pulse quite likely to be playing for an Asian Champions League place and looking to end their season on a high in front of their own very passionate supporters. Jubilo is never an easy game for us and we were very poor against them earlier in the season when their midfield dominated the game easily and their frontline, if in the mood, can finish chances off. Yet there is some hope, Jubilo recently have been on a terrible run of form and haven't won since a 2-1 victory away to Vissel Kobe on September 15th. Their game before coming to Nack5 is a home game to Grampus whose form is up and down this season, but they have won 3 of their last 4 games so Jubilo could be looking at another defeat against Nagoya.